Welcome to April! We're hoping April's showers don't get the best of us and that May flowers come just a tiny bit earlier this year. While even the slightest hint of warm weather is motivation enough to finalize a float plan and head to the harbor, sometimes a boating-related excursion can help kick the crew into high gear. Find a regatta, beach clean-up, or boating education event near you. Want more maritime events to choose from? Find a Blessing of the Fleet ceremony or Burning of the Socks gathering near you. Share your favorite boating events! Tweet at us, message us on Facebook, or email amanda.jones@dockwa.com. April 5: The 12th Annual Inter-Island Cruise is taking place from 6 - 10 PM. An opportunity for islanders, and islanders at heart to mingle, eat, drink, dance, and have a great time on the Casco Bay. April 2 & 9: Paddleboard Yoga from 7:40 - 8:35 PM at Portland Paddle. 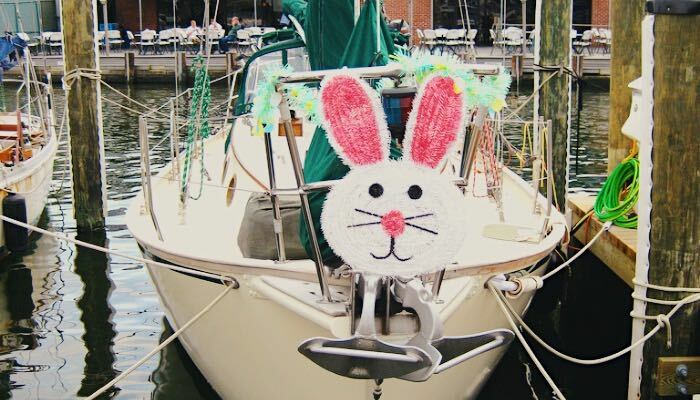 April 21: Enjoy a two hour Easter Brunch Cruise aboard the luxurious cruising vessel Odyssey. April 28: The 37th Annual Run of the Charles is Boston's Premier Paddling Race. It is the largest flat-bottomed boat race in New England and a major event in Greater Boston, drawing over 1,500 racers and spectators. April 1: Opening Day of Battleship Cove & Maritime Museum. April 13: Hop to the Carousel at Battleship Cove and meet the Easter Bunny, go an egg hunt, Easter crafts, and ride on the carousel. Grab your tickets here. April 16 - 20: Liberty Week at Battleship Cove. Explore a sailor's life with demonstrations, fun activities and games. April 27: Amateur Radio Day. Radio communications were absolutely crucial for Navy ships in the past. Join in while members of the Massasoit Amateur Radio Association make contact with operators near and far. April 27: Insiders Tour of the Destroyer. Tickets are $65 for general admission and can be purchased here. Hyannis – April 10 & 24: Hyannis Yacht Club is hosting the Ocean Racing Fleet-Mid-Winter Training Seminar to help boaters learn more about PHRF Ocean Racing. April 6: Tried & True Used Boat - Tackle Expo. Enjoy an outdoor display of used boats for sale from 9 - 5 PM. April 6 & 7: Boating Safety Course Class at the Wareham Free Library from 8:30 - 3 PM. Weekends in April: Seal Watching Tours in Newport Harbor. April 6: A Skimmer Tour & Point Section Cleanup is taking place at Perrotti Park. Help kick-off the fourth marina trash skimmer season just in time to celebrate Earth Month from 12 - 2 PM. April 7: The Alliance Francaise de Newport of Newport is presenting Solo Ocean Racing: A Special French Sport. Listen to Emmanuel Dary, a French Naval Commandant, tell the tales of famous solo races and racers at Salve Regina University. April 9: The Ocean Science Speaker Series is continuing this month at the Newport Public Library with a recent University of Rhode Island graduate, Sabrina Pereira, providing an overview of her research "Needs for Marine Beaches." She will also present results from water quality and environmental data used to build a statistical model for marine beach managers. April 12: The Janes Pickens Theatre & Event Center is hosting the 2019 Art and Design Film Festival: Walking on Water. April 16: NewportFilm and Around the Buoy & Latitude Yachts are presenting the film Morning Light (2008). Fifteen young sailors..six months of intense training..one chance at the brass ring. This documentary tells the story of a group of intrepid and determined young men and women as they embark on life's first great adventure. April 20: Coasters Harbor Navy Yacht Club is hosting the US Sailing One Day Race Management Seminar at the Officers Club on the Newport Naval Base from 8 - 5:30 PM. April 27: Spring Commissioning at IYRS: Prepare Your Boat for Boating Season. April 27: Join Clean Ocean Access + Bike Newport from 10 -12 PM for a cleanup with a difference. Ride the Ocean Loop and stop to do road side cleanups before it blows into the ocean. April 2: Quantum Sails Newport is hosting a highly informative and entertaining session with a special guest on How to Prepare for the 2019 Boating Season! April 6: Beach Cleanup at Bailey's Brook from 12 - 2 PM. April 17: Celebrate Earth Month with Clean Ocean Access. The open house event features special guest speaker as part of the ongoing Ocean Science Speaker Series. April 3: Women in Maritime Careers: Professional Stories of the Sea at the Mystic Seaport Museum from 5 - 7 PM. April 5: The Mystic Seaport Museum is hosting a daylong program - Franklin Lost and Found: Probing the Arctic's Most Enduring Mystery - which will present an international roster of scholars on various aspects of the Franklin Expedition tragedy and legacy. April 21: Easter Morning Paddle with Adventure Mystic LLC. Freeport – April 7: Come aboard the Sapphire Princess for a three hour Seal Watching Brunch. This event runs from 11 - 2 PM. Montauk – April 6: The Montauk Village Association is hosting a Beach Clean Up at Navy Road from 10 AM - 12 PM. Uniondale – April 5 - 7: The Long Island Boat Show. Frankford Township – April 8 - 10: The Skylands Boat Show. April 11: The Women's Sailing Club of Annapolis is hosting a meeting from 7 - 9 PM to teach sailing terminology to members of all skill levels. It is important to know the correct terminology while sailing to keep everyone on board safe! They will also be having trivia and prizes. April 13 - 14: Pirate Adventures on the Chesapeake is kicking off their opening weekend for the Spring Season by offering four sailing times on both days. April 26 - 27: Annapolis Sailing Cruises is hosting a Sailor's Delight Cocktail Cruise aboard the Schooner Woodwind on both Friday and Saturday night starting at 5:30 PM. April 26 - 28: The Annapolis Spring Sailboat Show is taking place at City Dock. April 27: The Universal Sailing Club's Spring Kick Off Meeting will be held at 2 PM. April 12 -14: On-Water Training at Bay Bridge Marina is being offered by BoatU.S. for the Bay Bridge Boat Show. April 12 - 14: Kick off your boating season at The Bay Bridge Boat Show! This is the largest spring in-water boat show north of Florida. The show will feature more than 400 powerboats from 7 to 70 feet including an impressive collection of fishing boats, center consoles, trawlers, express cruises, pontoon boats, and much more! Hampton – April 27: The Hampton Yacht Club is offering a course, Starting Line 101, from 9 AM - 12 PM to teach sailors how to approach the starting line, race marks and finish with confidence. Cape Charles – April 26: The 12th Annual Blessing of the Fleet Ceremony at Cape Charles Town Harbor Marina. Celebrate the local watermen and bless them for a safe, successful, and fair weather harvest. The ceremony beings at 6 PM. April 11 - 14: Sperry Charleston Race Week hosted by Charleston Ocean Racing Association. Oriental – April 12 - 14: The Oriental In-Water Boat Show. Surf City – April 27: The Dolphin Dip Dash, a 5K Beach Run will be taking place at Roland Ave Beach Access at noon. April 13: Oak Island Lighthouse Run & Walk at Middleton Park. April 27 - 28: Oak Island Parks and Recreation is offering the first annual fishing program called WAIT - Women Anglers In Training. The program is for beginners and more advanced angler women. It will run from 9 AM - 3 PM. April 6: On-Water Training at Freedom Savannah hosted by BoatU.S. April 21: Easter Sunday Brunch Cruise hosted by Savannah Riverboat Cruises. Hartwell – April 13: The Lake Hartwell Boat Festival is taking place from 10 - 3 PM at the Lake Hartwell Marina. April 20: The 9th Annual SUP Beach Races at Vanderbilt Beach. April 22: Earth Day Beaches and Bays Clean up at Delnor-Wiggins Pass State Park. April 6: Raise The Reef 2019. A fundraising event to ensure a future for coral reefs! April 22: Earth Day Dive Against Debris 2019 at the Rainbow Reef Dive Center. April 27: Kayak, SUP & Snorkel Clean-Up with CSHS Marine Science for Earth Day. Miami – April 14: Sundays on The River at The Wharf Miami. Pompano Beach – April 28: The Annual Pompano Beach Seafood Festival is held oceanfront at the Pompano Pier. Enjoy fresh local seafood prepared by area restaurants. Orlando – April 13: AquaPalooza! Join Central Florida MarineMax team for the biggest party of the year at the Disappearing Island sandbar for the day. April 5 - 7: The Clearwater Boat Show is taking place at the Westfield Countryside Mall. Tickets are only $5.00 for adults! April 20: MarineMax is hosting an Introduction to Boating Class from 9 AM - 12 PM. If you are a new boat owner or getting on the water for the first time, this class will help you learn boat terminology, boating safety, basic maintenance, rules of the water, and boat features + parts. Panama City Beach – April 24 - 28: The 2019 Seabreeze Jazz Festival features the top names in smooth jazz in one long weekend. Jacksonville – April 5 - 7: The Jacksonville In-Water Boat Show. Safety Harbor – April 8 - 10: The Safety Harbor Boat Show. Sarasota – April 26 - 28: The 37th Annual Suncoast Boat Show is taking place in downtown Sarasota at Marina Jack. Enjoy the great outdoors while pricing and comparing hundreds of boats! Apalachicola – April 20: The 20th anniversary of the Apalachicola Classic Boat & Car Show is taking place from 10 - 4 PM at Riverfront Park. April 7: 36th Annual Vero Beach Spring Boat Show at Riverside Park. April 13: The Moorings Yacht & Country Club is hosting the Wheels & Keels Car and Boat Show. April 4: Share the Beach sign up kickoff at the Erie Meyer Civic Center just in time for the 2019 turtle season. April 6: Beach Campout at Gulf State Park. April 20: Alabama Gulf Coast Slam fishing tournament at Fort Morgan Marina. April 26 - 28: LuLu's Paradise Boat Show at Homeport Marina. New Orleans – April 6 - 7: The 2019 Porsche of New Orleans Leukemia Cup Regatta is taking place at the Southern Yacht Club. San Antonio – April 22: Texas Cavaliers River Parade at the Hard Rock River Walk. Port Aransas – April 12 - 13: The 5th annual Port Aransas Wooden Boat Festival is taking place in the beautiful beach town, along with other boat building and boating programs. League City – April 12 - 14: The Southwest International In-Water Boat Show. April 6: Sunday Beach Cleanup at 11th Street. April 20: Earth Day Xanadu Coastal Cleanup. San Francisco – April 20: Earth Day Beach Cleanup hosted by Aquarium of the Bay. San Diego – April 5: Celebrate the 2019 Stagecoach Festival with the Boat to Stagecoach Cocktail Cruise. Richmond – April 4 - 7: The Pacific Sail & Power Boat Show at the Craneway Pavilion and Marina Bay Yacht Harbor. Belvedere – April 28: Opening Day on the Bay Festivities is taking place from 12 - 6:30 PM and is hosted by The San Francisco Yacht Club. Every Saturday in April: Marina Del Rey Farmers Market at County Parking Lot 11. Every Sunday in April: Free yoga in Burton Chace Park from 11:30 - 12:30 PM. April 17 & 24: Sunset Series Regattas 2019 hosted by The California Yacht Club. This series of sailing races will take place Wednesdays from 6 - 8 PM. The best viewing spots are at Fisherman's Village and Burton Chace Park. Newport Beach – April 25 - 28: The 46th Annual Newport Boat Show is taking place at Lido Marina Village. This year's show will feature the newest vessels to reach the Western United States. April 3, 10 & 17: The Yaquina Bay Yacht Club is hosting a discussion to help sailors learn the rules of racing and other sailing tactics. Free and open to members and local non-member sailors who may want to know more about race season. April 20: The Newport Public Library is hosting a Speaker Series Meeting at the Newport Public Library with the Chief Scientists at Oregon Sea Grant. Portland – April 27 - 28: The 27th Annual Spring Paddle Festival 2019 at Vancouver Lake Park. All events at the Festival are free and open to the public. Port Angeles – April 1: Jellies Exhibit Grand Opening at the Feiro Marine Life Center. Watch mesmerizing moon jellyfish pulse to the beat of the sea! April 19: Mysteries of Salmon - Locks Talk with Professor Thomas Quinn of UW College of the Environment. Listen to Professor Thomas talk about his research which included the interactions between wild and hatchery-produced fish, and the movements of salmon and trout in Puget Sound. April 23 - 27: Trawlerfest 2019 in downtown Seattle. General Admission is $15 in advance and $18 onsite. Click here to purchase tickets! Port Clinton – April 26 - 28: Celebrate the beginning of spring at The Catawba Island Boat Show, and see the newest and most innovative boats to suit your boating lifestyle. Hot Springs – April 4 - 6: The Hot Springs Classic is taking place on Lake Hamilton with tons of boating events to start Spring off the right way. Tickets are $60 and can be purchased here. April 20: Bunny Rock Chicago 5K & Kid's Egg Hunt will be taking place at Montrose Harbor. April 27: Chicago Rum Festival 2019 at the Logan Square Auditorium. Minneapolis – April 20: Fitzke Paddle Boards is hosting the BSLOL Paddle Board Workshop. April 10 - 13: White Marlin Roundup fishing tournament is leg one of the Abaco Diamond Series which is a perfect transition from sailfish to blue marlin season. April 12 - 14: Acklins Island Regatta is an annual sailing competition featuring a variety of festive activities, in addition to racing with Class A, B and C sloops. April 18 - 22: The Going Back to the Island Festival is a fun and activity-filled celebration that will feature a beauty pageant, Easter egg hunt, jack stones, hopscotch, a concert, and lots and lots of food. April 19 - 21: Join in on the fun for the Bimini Homecoming festival. This event is in honor of the locals who return home and join together in celebration. April 23 - 27: The 66th Annual National Family Island Regatta is a tradition that has started from 1954 and today is one of the oldest regattas in The Bahamas. April 30 - May 4: An exclusive invitation-only Billfish tournament, the Custom Shootout is an all-release format, limited to 50 custom-build inboard boats - 32 feet or larger. April 13: Tortola Torture is a 54K ultramarathon on Tortola. April 19 - 21: Spanish Town Fisherman's Jamboree is a popular fishing tournament which attracts many competitors as well as onlookers. There will be music, food, and tons of beach fun. April 22: The Governor's Cup Race. Share your event with us! Email amanda.jones@dockwa.com or post to our Facebook Group.